Discover 7 Awesome Anti-Inflammatory Juice Recipe’s you will love and 5 teas that fight Inflammation! According to the Oxford dictionary an Inflammation is a local physical condition that causes part of our body become swollen, reddened, or hot. This condition is often painful and may result because of infection or injury reaction. Inflammation is divided into two types, chronic and acute. This inflammation is considered as a natural immune system that is often helpful. This results when part of the body is hurt in various ways, for instance, you may have a sprained muscle or cut. This inflammation will help your body fight the inflammation helping it to heal itself fast. This type of inflammation is often harmful to your body since it goes on for a longer time than it should. It will occur frequently with other illnesses including tuberculosis, asthma, as well as Ulcerative colitis. Additionally, this inflammation may also cause other abnormal conditions in the body such as the tissue thickening, fibrosis, and scarring. This may also result in the obliteration of tissues as well as the death of tissues and cells. Most of the times, this types of inflammation indicates a possible attack of various autoimmune diseases. Inflammation is a condition that can occur in any part of your body. It may result because of physical injury to your tissue or because of infection. Since your immune system is always active in all parts of the body, the inflammation can occur everywhere. Various symptoms indicate inflammation. This includes excessive heat, swelling, redness, pain as well as the reduced functioning of a particular part of the body. For instance, if your throat hurts when having bronchitis or your knees hurts after running for a short distance, the discomfort may be as a result of inflammation. If you have been looking for the best remedy for inflammation, we have rounded up various drinks that can help you out. These anti-inflammatory drinks will play a major role in managing the muscle pain as well as the stomach. They are not only easy to prepare but also digest faster than the anti-inflammatory food. This means that you will get effective results faster. Juicing is a perfect way of nourishing the body with minerals, vitamins, minerals, as well as phytonutrients. Though it might not be necessarily healthier than consumption of veggies and fruit, they are easier to consume and release the nutrients fast as they are easier to digest. We have various veggies, fruits, herbs, spices, and roots that can create a healthy anti-inflammatory drink. Although the inflammation causes will depend on your immune system, the ingredients included in these drinks will do a great job in alleviating inflammation-related pain. Before looking at this juice, we will start by rounding the best herbs, fruits, and veggies that work against inflammation. This is a spice harvested from the turmeric root. This spice contains various compounds such as Curcumin that does a great job to decrease inflammation. The plant has a lot of scientific backing when it comes to its effectiveness in treating inflammation. This makes one of the best spices to use in your anti-inflammatory juices. The root of ginger plant helps in the treatment of various health issues including pain and nausea. This is why it is commonly found in many diet juices. The roots also come with a good taste and flavor that works well together with savory and sweet flavors. Pineapples are not only delicious; they are also full of vitamins and minerals that are beneficial to our body. They are known to be rich sources of Bromelain, which is a natural inflammatory remedy , vitamin C, B vitamin, and fiber, which all plays a major role in reducing the inflammation. According to a study conducted by the University of Oregon, the Tart juice helps in reducing the inflammation levels as well as soreness. The University conducted their research using athletes, proving its effectiveness. There is a broad family of citrus fruits including the oranges, limes, lemons, and grapefruits. All these fruits are rich sources of antioxidants, which are useful in eliminating the environmental toxins. The fruits are also rich in vitamin C as well as other compounds that help in reducing the inflammation. Celery is full of vitamin K, antioxidants as well as vitamin A. these are all ingredients that play a pivotal role in fighting inflammation. Celery has a high content of water, crisp flavor as well as low calories. In addition, all cabbages, whether Savoy, red, green or Chinese are powerhouses of antioxidants that does a great job in reducing inflammation. Besides adding a great color to your juice, the red cabbage has the uppermost antioxidants levels whilst the Savoy variety has the highest anti-inflammatory properties. As a common juicing ingredient, Spinach contains a high level of minerals and vitamins. Some of the helpful compounds found in spinach include magnesium, vitamin A, as well as antioxidants. It is also one of the most juiceable vegetable thanks to its mild flavor as well as high nutrition value. Broccoli is another great vegetable that contains high levels of antioxidants. Similar to the spinach, the broccoli also has a high dose of vitamins and has a placid taste. Tomatoes contain high levels of Lycopene, which is known to lessen the inflammatory disease risk. It also comes with a bright color and mild color making it one of the best fruit to blend. If you prefer having a bright and sweet anti-inflammatory juice, you should go for the beets. These veggies contain betaine, which is also a compound that has promising results when it comes to the reduction of inflammation. Additionally, all the parts in beets (roots and greens) are edible allowing you to great a delicious juice that contains all the ingredients you need. Berries are some of the fruits that have high antioxidants. These sweets fruits also have high levels of polyphenols compounds, which are responsible for regulating the inflammatory responses. The bold colors, tart, and sweet flavors make them great to use in all juices. While garlic is relatively pungent than the onion, it comes with various health benefits that you cannot find in other vegetables. Medical research shows that it is effective in dealing with digestive system inflammation, which is caused by IBD. Parsley contains a plant chemical referred as Carnosol, which has shown positive, results when it comes to the reduction of inflammation. Since it makes a perfect garnishing ingredient, you can easily incorporate it into your juice. By combining the above potent anti-inflammatory ingredient will help you create delicious juices that combat inflammation issues fast. Although these recipes should not substitute medical care, the doctors will not discourage use of this juice in efforts of strengthening your immune system. When making the anti-inflammatory juice, you will need simple and readily available ingredients and a juicing machine. You will also need cutting boards and knives to prepare your ingredients. These are some of the healthy and delicious anti-inflammatory juices that you can prepare at the comfort of your home. We have only listed a few but you can play with the ingredients above to make a delicious and healthy juice to battle inflammation. When making the juice, you just need to follow the steps that you do whenever you’re making natural juice. You simply need to wash the ingredients well, chop them, place them in your juicer, and serve. The purple cabbage fruit juice is delicious and contains various vitamins and nutrients that do a great job in boosting your immune system. This juice incorporates various fresh carrot and fruits to take out the piquant flavor found in the purple cabbage. As mentioned earlier, Turmeric is a powerhouse of anti-inflammatory properties. This recipe incorporates cucumber coolness, carrot sweetness, as well as lemon tang to remove the turmeric root bitter taste. This is a perfect choice for individuals who love adding natural sweeteners such as honey to their juices. The best thing about this juice is that you do not need to add any sweetener as it is naturally sweet. The juice includes superior inflammatory fighters to give you with a delicious yet effective natural remedy for inflammation. 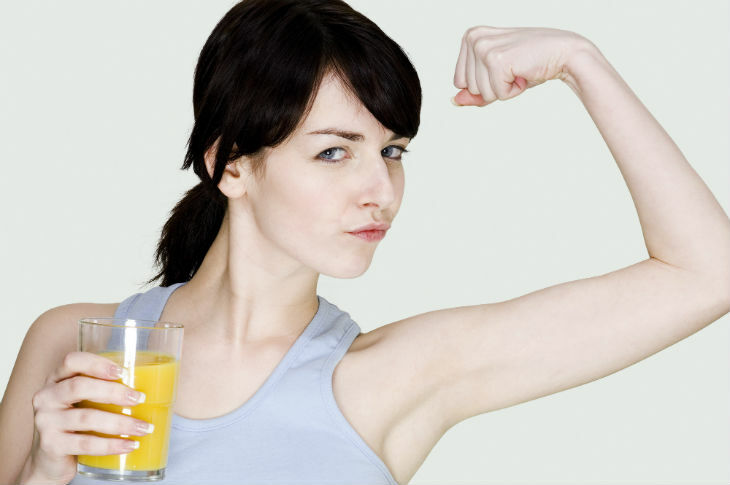 This juice contains popular anti-inflammatory foods that offer desirable result. The recipes contain a combination of fresh spice, vegetables, herbs that have a citrusy twist. This is another all-natural and balanced juice that makes use of the best natural anti-inflammatory veggies, spices, and fruits. We have also included pears and carrots to offer you with a flavor that you will love. Combining equal parts of fresh fruits and spring greens plus the natural goodness of turmeric and flax seeds, you will get all the useful compounds needed to fight inflammation. To better the taste of this juice you can also make use of other natural ingredients such as ginger and honey. Including the best superfood that contains useful vitamins, antioxidants, plant chemicals and minerals that enhance our health, you can be sure to get the best of both worlds in this juice. The best thing is that the juice is made from readily available ingredient some of which that you can grow in your kitchen garden. You have seen some great juice recipes now this short video will show 5 teas that fight Inflammation. All the above fruits, herbs, spices, and veggies will help you in reducing the inflammation by strengthening your immune system. As you can see, all the products used are natural and if you have space, you can grow them in your home. If you are prickly, you can experiment with a combination of this ingredient until you find a fruit juice that suits your taste. Additionally, adding natural products such as honey can help you make a juice that you will love!